My 1st 9 ripe fresh figs & Vegan + Gluten-free fig cheesecake mini bars! My first 9 ripe figs from my own fig tree! yeah! I was just saying to my dear friend, Norma that she had her first ripe figs from her own tree & that I hadn’t seen any ripe yet! I was wrong! Today, I invented these vegan no-bake cream cheese cake bars with fresh figs. It was the 1st time, I have made vegan cream cheese bars. I thought, the next time, I must double the volume of the cream cheese, for a thicker filling, in the middle. But after being in the fridge all night, the next day, my husband & I loved them as they were because the cream cheese layer had thickened enough, to our liking! I used fresh thinly sliced ripe figs from my own fig tree in my garden. These are so tasty , creamy & have the right texture, I think! You can make 6 thicker cream cheesecakes out of this batter instead of 12 smaller & thinner layered cheesecake bars! Recipe: For 6 thicker or 12 smaller vegan no-bake cream cheesecake bars! 1 cup of finely crushed Vegan Gluten-free cookies with chocolate : measured when finely crushed/ I crushed my cookies this way : I placed them in a plastic bag & closed it well. I put the bag on a chopping board & bashed the bag a lot, until there were cookie crumbs left. Now, you can measure it too & it is easier to use! 1. In a Kenwood bowl or in a bowl: add cookie crumbs, melted vegan butter, sugar & almond powder. If you are using your Kenwood, place the K-paddle in. Mix until everything is well-combined. Or in a large bowl, mix everything well with a wooden spoon. Line a baking dish with the size of 19 cm x 19 cm with parchment paper, slightly overlapping the edges, to easily remove the bars later on. Press this mixture in the baking dish. If you want to create 6 thicker cream cheesecake bars, you must use a smaller baking dish, like 11 cm x 11 cm. Place into the fridge. 2. Clean your Kenwood bowl & add cream cheese, 1 teaspoon of lemon juice, 2 tablespoons of white fine sugar & a pinch of sea salt. Mix until all is beautifully combined. Scrape the sides of the bowl & mix again. Taste! It has to taste like a lovely cream cheese mix with a touch of lemon! Take the cookie crust baking dish out of the fridge & put this cream cheese layer equally divided over the cookie crust. Spread it all out with a knife, if you need to. 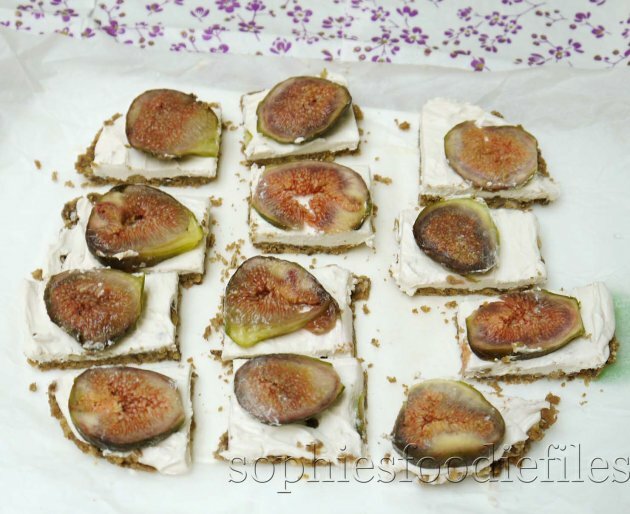 Arrange the cut up fig slices over the cream cheese. I used 12 thinly sliced fig parts. Place the dish back into the fridge to stiffen up, preferably all night long. Cut into 12 bars. Enjoy these bars with a loved one! They were just perfect for my husband Peter & I! Store them in the fridge. You can also find my tasty recipe shared here: http://www.instructables.com/id/Vegan-Gluten-Free-fig-mini-cheesecake-bars/ ♥ Stay Tuned & subscribe by email! Join 1,800 email subscribers now!!! It is free!!!! Click the link here below to subscribe!!! Next Post Vegan double coconut vanilla oatmeal! These look so great,light and delicious!! I love this combination! Great post Sophie! I don’t think they are that light! Don’t worry…! I’ll substitute the tofu tutti cream cheese with something else 🙂 I always modify the recipes,because of my celiac 😉 I don’t have any other option! Oooh,..So sorry to hear that but tofutti is gluten-free & vegan! Check out their websiite! I used here vegan + GF chocloate cookies for the base! Hi Sophie. This looks wonderful! I congratulated myself on finding some really beautiful ripe figs in my local market at the weekend (and have been enjoying one or two each day since), but it must be delightful to have your own supply! They go so well with cheese, don’t they? Figs are so yummy and I love your cheesecake bars. Hugs! yummy 🙂 I think I would make a cashew cheeze instead of the cookies. You mean a cashew cheese intead of the topfitte cream cheese????? Homegrown figs…I am jealous! The cheesecake bars look so inviting! 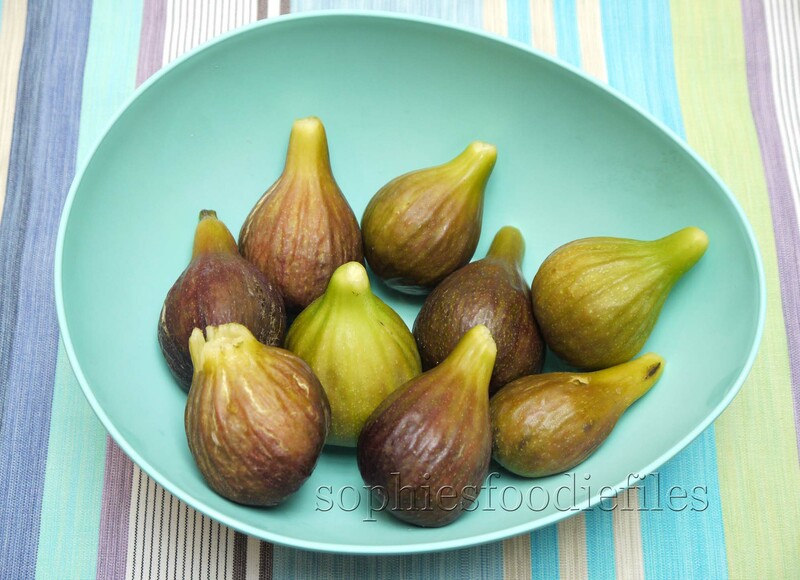 Oh wow Sophie… Fresh figs.. How awesome is that? Loved your recipe. Simple and healthy. I just had some tofutti cream cheese on my roast for b’fast:). I have three tiny figs growing on my little tree, I am hoping they will ripen before the fall sets in. I prefer to pair figs with goats cheese and more savoury preparations, but these look like lovely little desserts on a summer day. These look delectable. As a fellow lover of figs, I’m inspired and impressed by this recipe! Holy moly. These look amazing Sophie. That second photo is a winner! Big YUM. How lovely to have your own fig tree. I just saw your other fig posts. With ripe home grown figs, the cheesecake fig bars look delicious! Looks awesome! Fresh figs are so good! Haven’t had them in ages. These cheesecake bars are GORGEOUS! I want to eat them right now. I’m so jealous that you have a fig tree!!! I only ever get figs around Christmas time and they come from the store….it would be soo cool to grow them. Fig trees have a lot of spiritual significance too! Oooh,…I didn’t know thgat, Koko? What does that mean then? Enjoy the tasty fig bars! Gorgeous cheesecake, girl! And look at those figs!! 😀😀 Thanks, Anne! Enjoy them! Your fig cheesecake bars looks delicious. I was too lazy and just popped the figs in my mouth. So impressed that you’re growing figs! Your garden must be beautiful. This all does look yummy! Love this recipe and looking forward to more recipes using figs! Thank you for sharing this recipe! I love figs.